Get started monitoring rivers with Edenvale RiverWatch in three easy steps. These steps are the essential first steps that can be done by anyone. But there is more for those who are interested. First, set up a pollution monitoring network. Understand how to effectively report pollution events and get action in your particular area, usually from the relevant local authority. Second, record the health of the river using MiniSASS bio assessment. This shows the impact of pollution or other human activity on the health of the river over over the last few months. Third, set up Fixed Point Photo Monitoring of place of interest or which are vulnerable. And then, collect useful information on your catchment so that it is available when it is needed. This includes previous environmental assessments, rainfall and peak flow records and newspaper records of floods. You can move on to other monitoring tools such as the Riparian Habitat Assessment. When new developments advertise the Public Participation Process of the Environmental Impact Assessment you can participate in an informed way without searching for information. When someone sees pollution or some other problem in a river they may tell other people or comment on social media. Often the person is not sure if things have changed or whether it is serious enough for action, and therefore does nothing. Even when action is taken precise details such as the time, place and characteristics may be missed. But small changes in one place can show there is a bigger problem upstream, perhaps in a place not usually seen. Details can help identify what happened even if the signs have passed downstream and disappeared which can happen in a few hours. This ensures everything everything is noted. The answers are automatically uploaded into a database where they are retained for future use. It takes about two minutes to complete. 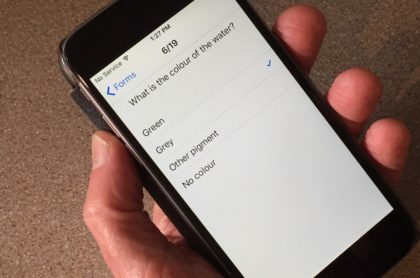 The RiverWatch Pollution Tracker asks questions only on what is observed, so this can be done by anyone and does not require touching the water. The RiverWatch Tracker App also tells the user how to report pollution events to the responsible local authority should this be needed. The RiverWatch Pollution Tracker overcomes these problems by recording the details entered by the observer together with date and time. In time this will give a history so that the situation in a river or stream can be understood. The same App is used to record more technical information where there is a river monitoring program in place. Monitor the river with MiniSASS bio assessment. Anyone can use this with easy training. Full details and training are given at the MiniSASS website. The MiniSASS website also includes a database for recording results. 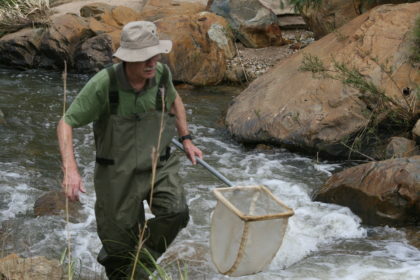 Invertebrates show different levels of tolerance to changes in water quality, so by identifying those present the state of health of a stream may be assessed. This is an indicator, that is, it shows how events in the recent past have impacted the health of the river. It can be difficult to show changes to a river or landscape if not started at some point with a plan or intent. One might be able to find photos from the past, but they will have been taken over time by different people using different equipment, and likely not showing what is important now. It is difficult to use these to produce a record of important changes. Instead take photographs at carefully selected sites with an objective in view, in a way that can be repeated next time. Store them in a way that makes them easy to find and sort. There are many methods published on how to do Fixed-Point Photo Monitoring. However these methods can be simplified in the urban environment because there are many landmarks available. Here is a simple method. First select sites and objectives. The sites should be accessible and legal. There are two types of objective. 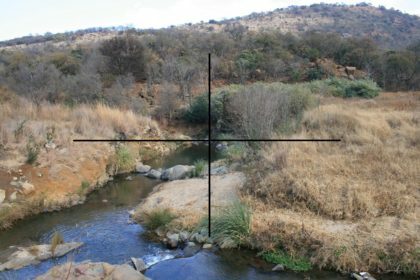 Landscape objectives with a fairly wide view show changes in vegetation such as encroachment of invader plants, changes to land use or development, or the site of attempts to improve the river. 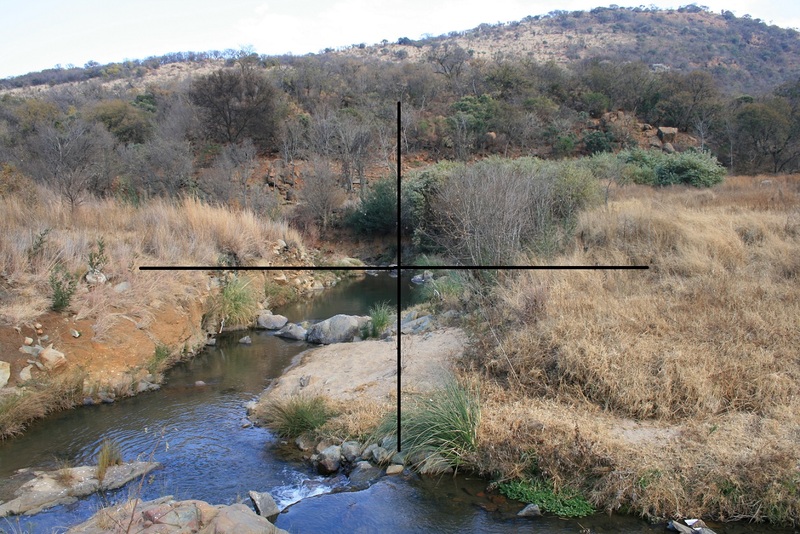 Point of interest objectives are used to show specific changes, for example a section of stream undergoing erosion or the site of a future pipeline crossing. Next, select and record the camera position. Choose a position that is easy to describe, for example “third pillar on the bridge from the east”, or “one meter on the river side of the first light pole”. Take a photo of the camera in this position. Take the first photo. This is best done with a SLR camera but others can be used if there is a center of field marker. Center the photo on a clear landmark such as a distinctive rock, or a cross section such as a tree (vertical line) and a path (horizontal line). Record the camera settings, for example focal length 35 mm or 55 mm. Take photos at more than one focal length as they may show different features. At home, download the photos and store in a folder for each site. Rename the photos by site name, date and setting, in a way that they can sorted by date and setting. Copy one photo and using Edit, place a cross over the center. Keep this as your reference photo, together with your notes on finding the site and positioning the camera. Print this to use when visiting the site again so that you can take an identical photo each time. These eight impacts are scored giving an overall assessment of Riparian Health. Evidence is obtained by motion activated cameras and by photographing tracks. The evidence is entered into the University of Cape Town Animal Demography Unit (ADU) database where it is validated and becomes part of the national MammalMAP research project.